On July 17, 1860, the Greek Government contacted the Imperial French Mint through its Ambassador in Paris to have the first Greek stamps printed in France. The chief engraver of the Mint, Albert Barre, was given the task to design the stamps according to the specifications provided by the Greek Government. Barre prepared a model which consists of a black French essay of 1853 whose center has been replaced by a hand-drawn Hermes head and blended to the background by India ink. The upper and lower inscriptions are blacked out and the inscriptions intended for replacement are seen at the top right in pencil. At the bottom is the manuscript dedication of Albert Barre to his friend N. Rondot. THIS IS THE ONLY KNOWN ARTISTS MODEL FOR THE LARGE HERMES HEADS STAMPS. 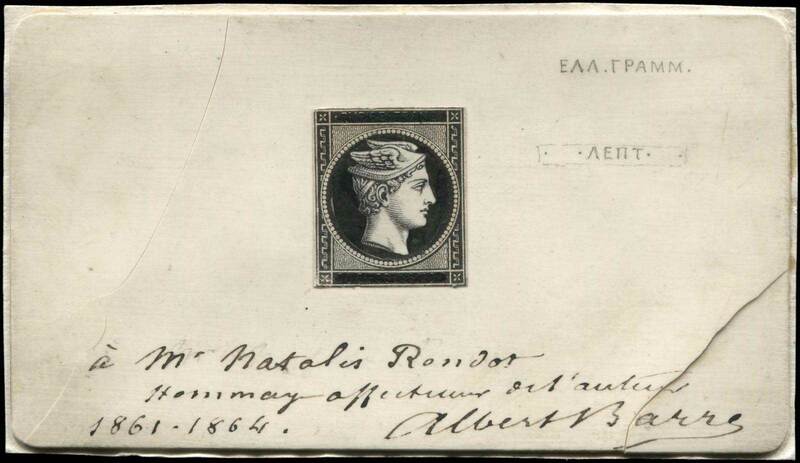 AN ABSOLUTE SHOWPIECE OF THE GREATEST IMPORTANCE FOR THE GREEK PHILATELY. (Konst. ΔΟΚ.Ι).